The 2015 Ford F-150 has been revealed. The weight savings are massive, 2.7 liter EcoBoost engine is a reality, and the look is pretty far off from the Atlas concept we've been dissecting for the past year. The fully boxed ladder frame remains, but built with steel that's both stronger and lighter than what's in the outgoing model. Aluminum has been used in previous F-150s and we've been talking about the greater role it would play in this model for ages— now is seems the rumors of "700 pound weight savings" through usage of the metal held water. It's used in the body of the pickup for the first time, which Ford claims will improve dent resistance as well as reduce weight and improve efficiency. New engine options include a 2.7 EcoBoost with auto start/stop and a naturally aspirated 3.5 V6 with variable cam timing. 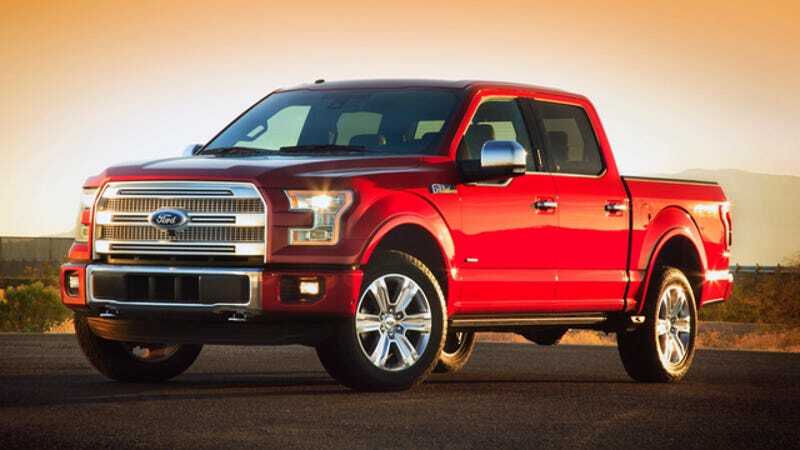 Those join the 3.5 EcoBoost and 5.0 V8 engine sizes already in use in the current F-150. Active grille shutters that balance cooling needs with aerodynamics should also help the truck maximize fuel. The 2015 F-150 is loaded with tech, upping the industry ante with 360 degree parking via four cameras, a remote-activated power tailgate, LED spotlights, and 400 watt power outlets for device charging. An eight-inch touch screen infotainment center complete with Ford apps will occupy the center console, and a "smart trailer tow module" will help drivers keep close tabs on trailer lights and wiring from the cab of the truck. Metal cleats in the bed and a retractable step will ease cargo loading and securing. Seat belts include a tubular airbag to distribute crash force more evenly across occupants and minimize injury. The XL, XLT, Lariat, Platinum and King Ranch trim levels are being maintained, as well as an FX4 off-road trim with an electronic locking rear axle, skid plates and off-road-tuned shocks. No new bodystyle Raptor has been officially promised. Colors available so far are three earth tones, two reds, two blues, two whites, silver, and black. I'm looking forward to seeing it in person at the Joe Louis Arena in just a few hours, when I'll deliver our first impressions of the F-150 in the skin.